Though long concealed from Western history books, it was never a secret that Hitler and Stalin were great allies and jointly triggered World War II. In a sense, this alliance, seemingly broken as the war unfolded, never really stopped working and endures as if it had never been broken. However, many in the West have been deceived by propaganda and a confused view of events. Now, Russian President Vladimir Putin has just reaffirmed – once again – Moscow’s sympathy for the 1939 non-aggression treaty between the two European dictators. With his peculiar cynicism and in-your-face lack of ceremony, Putin said the USSR was not to blame for the invasion of Poland and blamed the British for the atrocities Hitler perpetrated in cooperation with the Soviets and with Western Communist parties. 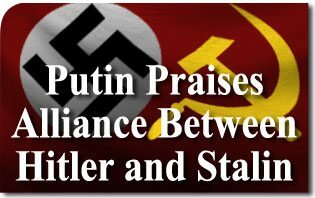 Putin called several researchers and academics to put together a work arguing that, by signing the Ribbentrop-Molotov Pact, also known as the Stalin-Hitler Pact, the USSR did nothing wrong. His meeting with the scholars was reported by the German website, Spiegel Online, The New York Times, and the British newspaper The Telegraph, quoted by the official German radio Deutsche Welle. Putin stated that every research worthy of credit should come to the conclusion that the accord between the two dictators was part of foreign policy methods of the time. Obviously, the historian who fails to demonstrate this will lose credibility and his career in the “new USSR” will be over. “The Soviet Union signed a non-aggression treaty with Germany. People say: ‘Oh, this is bad’. But what’s bad about the USSR being unwilling to fight?, the Russian leader craftily asked. Putin complained that the USSR is accused of having divided Poland but, he added, when Germany attacked the country the Poles were part of Czechoslovakia. If anyone understood the logic of his argument, please let us know. According to The Telegraph, as far as Putin is concerned, Russia deep down was right to sign the Nazi-Communist agreement and it turned out to the good. Moscow cynically denied the existence of the Ribbentrop-Molotov pact until 1989. But it was useless to try and silence the obvious truth. Signed by Joachim von Ribbentrop, Foreign Minister of the Third Reich, and by his Soviet counterpart, Vyacheslav Molotov, the treaty gave Germany guarantees that the Soviet Union would remain neutral in the event of an offensive against Poland. Putin had already tried to defend the pact between Hitler and Stalin in 2009 at the ceremony in Gdansk commemorating the 70th anniversary of the outbreak of the Second World War. The agreement with Hitler’s Germany enabled the joint Nazi-Soviet invasion of Poland that triggered World War II. But Putin claimed that was not the only cause. Putin simply repeats the old anti-capitalist ritornello: capitalists and Anglo-Saxons are the ones to blame for Hitler’s atrocities. Indeed, in 1938 the appeasement-seeking governments of England, Italy and France signed the infamous Munich Agreement, which constituted a veiled surrender to Nazi Germany. But there were distinguished persons also in Brazil, such as Plinio Corrêa de Oliveira, who strongly condemned that agreement. That is what many self-proclaimed West defenders appear to do now as they compromise with Vladimir Putin and his invasions of neighboring countries!